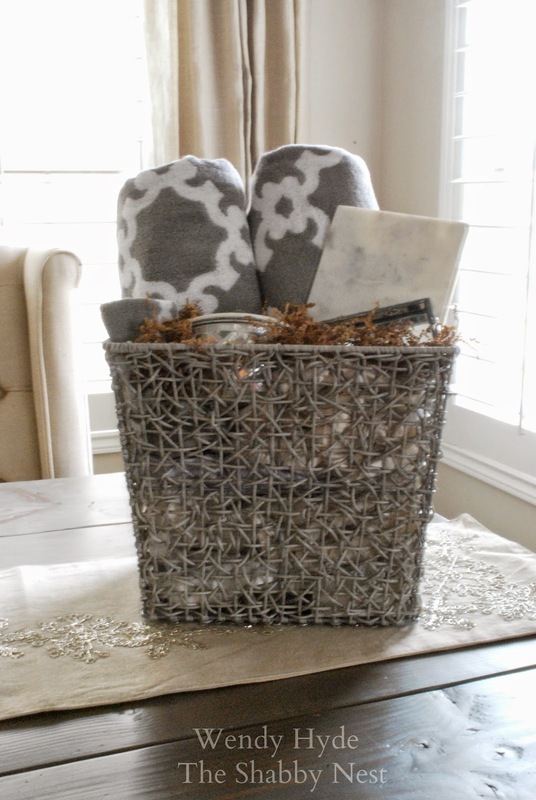 Today I'm partnering up with HomeGoods (one of my favorite stores) to share a gift basket idea that I created using wonderful items I found there. 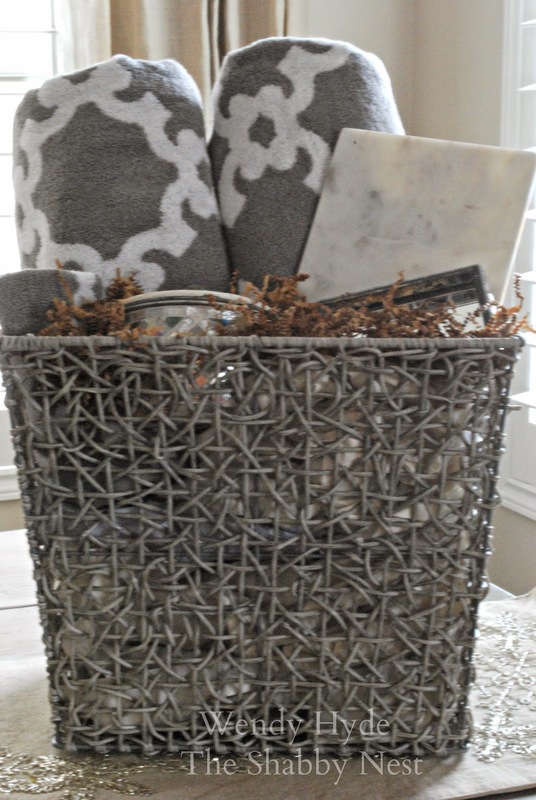 Here's the thing...if you're a procrastinator, there are still all kinds of wonderful gift ideas at HomeGoods...I just picked up these goodies this last week, and the gift basket turned out wonderfully! I started by deciding on a theme. I thought it might be fun to gather up some useful - but pretty - items for the bathroom. Just because something is useful doesn't mean it can't be fun to look at, right? I needed a container to put the goodies in...and I wanted it to be useful as well. I found this pretty basket that could double as a trash can if you put a bag in it. Of course, it could also be used for tons of other things as well...but I was specifically thinking "bathroom". Then I grabbed a couple of soft, patterned bath towels and washcloths to match. 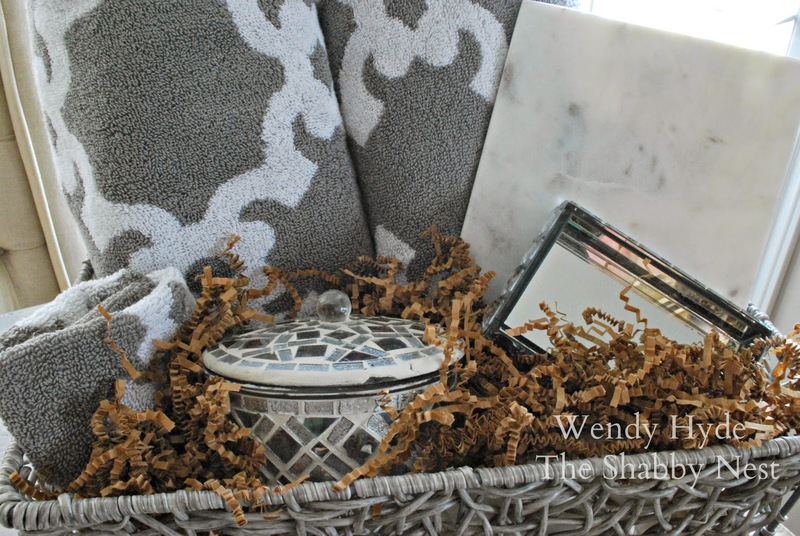 I topped it off by grabbing a pretty marble tray that could be used to corral bath necessities on the vanity, a lidded glass bowl, and a mirrored catch all. I don't know about you, but I find myself leaving jewelry on my bathroom vanity all the time, and a little mirrored tray would be perfect for that. Then I loaded them all in the basket and topped it off with some fun shredded kraft paper. The whole thing ended up looking great, and I'm sure it will brighten Christmas day for someone special! Thanks to HomeGoods for sponsoring this post! The opinions expressed in this post are 100% mine.